A child deprived of mother’s love, a businessman deprived of wife’s love and a woman deprived of husband’s love. These three strangers find solace and affection in each other. Some relationships don’t have any name. All you just need is a tender and emotional heart to feel that relationship. Can you find a wife’s love and mother’s affection in a prostitute? Possibly not. Brothel is not a place for white collared people to visit. Bengali Author Bibhutibhushan Bandopadhyay composed a beautiful story of a prostitute through his short story – Hinger Kochuri which was later adapted for Bengali movie – Nishipadma and Hindi movie – Amar Prem featuring Sharmila Tagore and Rajesh Khanna. The premise of this story is set in Bengal where a village woman named ‘Pushpa’ is abandoned by her husband for another woman. With no one to look after her, she is cheated by one of her relative who dumps her in one of a brothel in Calcutta. Deprived of wife’s love, a young businessman named Anand finds solace and compassion in Pushpa. He becomes her regular visitor with a hope to heal the wounds of his broken heart. At the same time, Nandu a small kid troubled by the harassment of his step mother finds motherly love in Pushpa who not only feeds him food but also gives her unconditional affection. Unaware of the occupation of Pushpa, this innocent Nandu become a regular visitor to Pushpa to gain motherly love. Here at this point, Pushpa forms a strong bond with Anand and the little kid Nandu. In the later time, all these three individuals go their separate ways. Nandu, now a grown up man returns to Calcutta as engineer with his wife and child. Here Nandu again meets Anand who used to pamper him with delicious samosas. They both together meet Pushpa who is now working as a servant. Anand unites Nandu with his foster mother Pushpa who gave him the mother’s love when he was deprived of motherly affection. What a beautiful story!!! Despite being a prostitute, Pushpa offers her unconditional affection to Anand as a caring wife and as a mother to little Nandu. I found this story very unique; emotional that highlighted the emptiness of the people who are deprived of true love. Amar Prem is a milestone in history of Hindi cinema that highlighted the emotions of a prostitute and exposed the white collar people who visit such red light areas. The presentation of this story is so beautiful that one feels sympathy for the protagonist Pushpa who is forced to live life of a prostitute. For decent women of society, woman like Pushpa is an outcast, a sinner. But irony is that majority of people visiting the brothel are white collared, decent people. Through this movie, the director has showcased the dark side of decent society. I love the movie for its unique story, power house performances of Sharmila Tagore as Pushpa and Superstar Rajesh Khanna as the sad hearted businessman who wins the audience with his memorable lines – Pushpa, I hate tears. 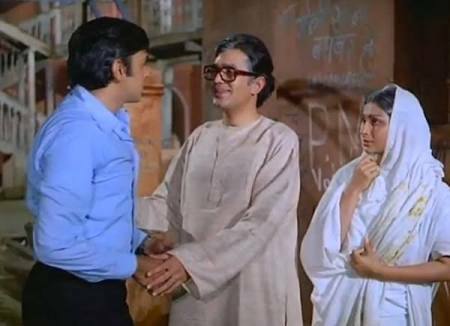 Late Actor Vinod Mehra played the role of grown up Nandu who later takes his foster mother from the shackles of poverty and gives her the honour of mother. Really, such relationships are beyond understandings. If you want to understand human emotions, read Bengali literature which has stored stories like Kabuliwala, Chokher Bali, Pather Panchali and Anand Math. Kishoreda’s songs were instrumental in making this movie memorable. ‘Chingaari koi bhadke’ and ‘Kuch to log kahenge’ were the best songs composed by Burman. The characters in this movie are larger than life and appear more real than real life people. You empathize with the emotional trauma these characters go through. Sometimes I connect with the character of little Nandu and Anand who yearn for heart felt affection. Who can understand their emotions better than a melancholic writer like me? The tears are still in my eyes. But I won’t shed a tear because I too hate tears. Beautiful review…short and so crisply wonderful like a platter of biscuits and tea that the folks in Calcutta love so much…. I remember watching this movie long time back and till now I only remembered the Pushpa dialogue. After reading this article it gave a nice flashback to the movie. Very nicely described, keep writing!